but I have to squeeze this in while I’m able. Cubital tunnel syndrome is caused by compression of the ulnar nerve when it passes under a bony bump (medial epicondyle) on the inside portion of the elbow. In this area, the nerve is relatively unprotected and can be trapped between the bone and the skin in a tunnel called the cubital tunnel. 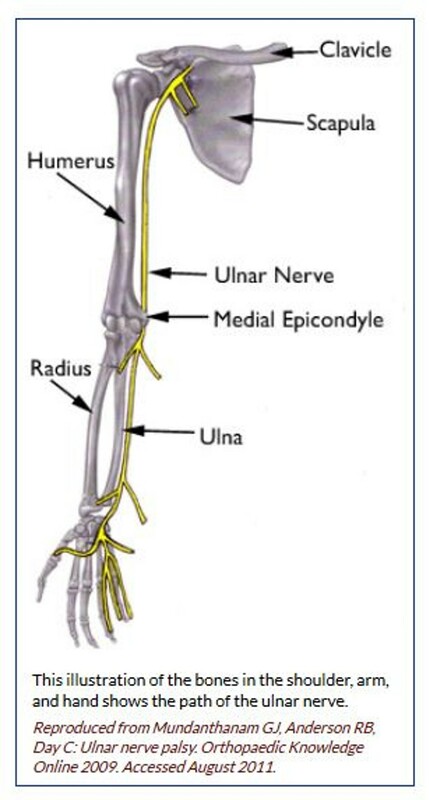 Though it is not an actual bone, this area is commonly called your “funny bone.” When you hit the “funny bone” just the right way, you have actually hit the ulnar nerve. This contact sends a sensation of tingling, numbness and pain along the inside of your arm and down to the ring and little fingers. When the ulnar nerve is compressed, it causes the same type of symptoms. The ulnar nerve can be pinched at any point along its length, but the most common site of compression is on the cubital tunnel. Actually, the pain shoots down my arm and flies offa my finger tips. Soooo, I’m awaitin’ for the phone to ring. You know the one, your surgery time is… My left arm will be first and then the right. Update: Surgery on my left arm will be Thursday the 26th. Not lookin’ forward to this one but no use whinin’. This entry was posted in Health and tagged Compress, Compression, Cubital Tunnel Syndrome, Elbow, funny bone, Medial Epicodyle, Numbness, Pain, Tingle, Ulna Nerve. Bookmark the permalink.